Les Moxon, G6XN (sk) Moxon authored a July 1952 QST article, "Two-Element Driven Arrays." Several other of his articles appeared during the 1970s and 1980s in Ham Radio magazine. 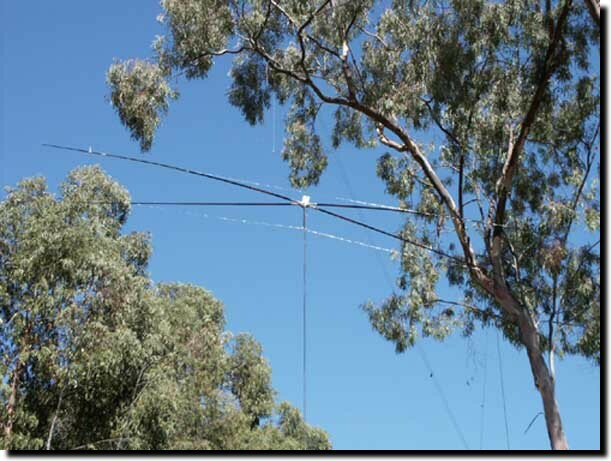 In the May 2003 QST, an article by Allen Baker, KG4JJH described a portable 15 meter moxon rectangle antenna using fishing poles as spreaders. I was intrigued. But it wasn't until KD6WD, John in Redding Ca., offered to include me in a small moxon project group, that I became a proud owner of a moxon of my own. John kindly shipped me some spreaders, a homebrew hub and some 16 gage silver coated copper wire...all that I needed to build my own moxon. Thus, KD6WD became my moxon Elmer and I am very thankful to him for introducing me to this wonderful, easy to build directional antenna. 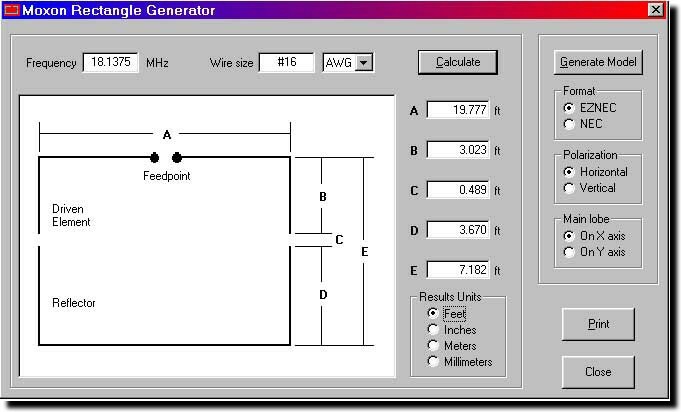 Here we see the software set to design an antenna for 17 meters using 18.1375 as the center frequency. By changing the frequency and wire size, the software calculates the measurements labeled A-E. What could be more simple, eh? Now, we just need to measure and cut the wire according to the measurements shown, and assemble the antenna. To download this software, CLICK HERE. 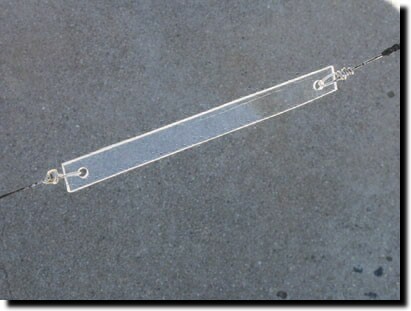 Spreaders can be made from a variety of materials. 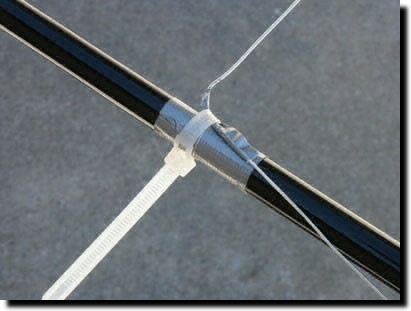 I use crappie fishing poles, which are 16 foot telescoping fiberglass rods in an "X" configuration. These poles can be found by looking at fishing supply stores on the Internet. The hubs I have used to hold the poles at the center have varied. John originally sent me a hub constructed from some aluminum tubing, flattened in the center to create a hub. I have also used PVC joints as a hub. Both hubs are shown on this page. 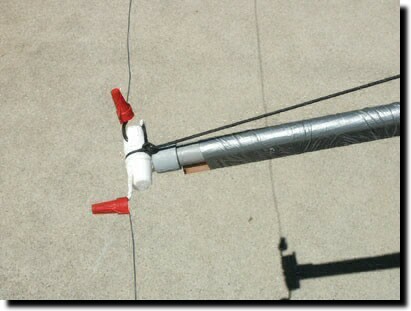 But you can also use a flat piece of material and simply tie down the poles on that material using wire ties or clamps. Above, we see the hub assembly of my 17 meter moxon. This one is hung from a 50 foot tree. 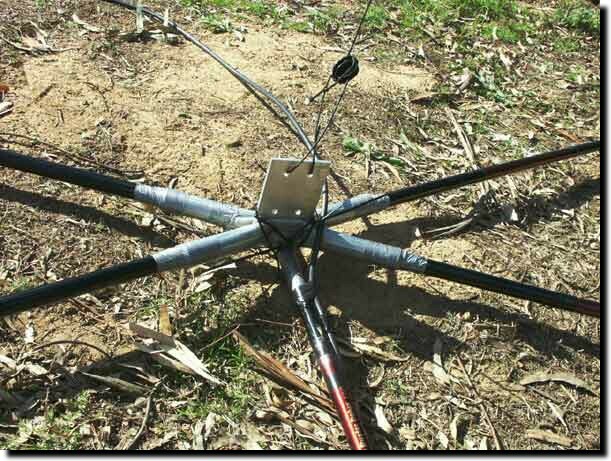 You can see the X configuration of the hub and the 5th spreader attaches the coax to the feed point of the driven element. Here is a close up of the feedpoint of my first moxon. I am using a 1:1 yagi current balun suspended on a small piece of wood from the hub extended out to the wire. Notice that I use wire nuts to attach the balun to the antenna. I started using wire nuts to make connections on my wire antennas a few years ago at the suggestion of W5DBG. If you squirt a little oil on the wire prior to putting on the wire nut, then the connection will be very solid and will not corrode over time. And, it is very simple to make adjustments...just cut and re-tie using the wire nut. If you measure precisely, using a balun at the feedpoint or not, you should get a perfect 1:1 match over the entire 17 meter band. I have built 5 or 6 different moxons now, for 10, 15, 17 and 20 meters. They ALL have had perfect 1:1 matches at the design frequency. They are also quite broadbanded and will take all the power you can put into them. 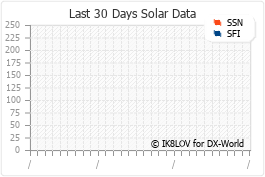 I typically run a kilowatt into mine during greyline dx contacts and always get great signal reports. Here is my 15 meter moxon. Notice the use of PVC as a hub and feedpoint supporter. I used a smaller piece of pvc that fits perfectly inside the spreaders and into the pvc connector. I also used a small piece of cord to support the feedpoint from above. 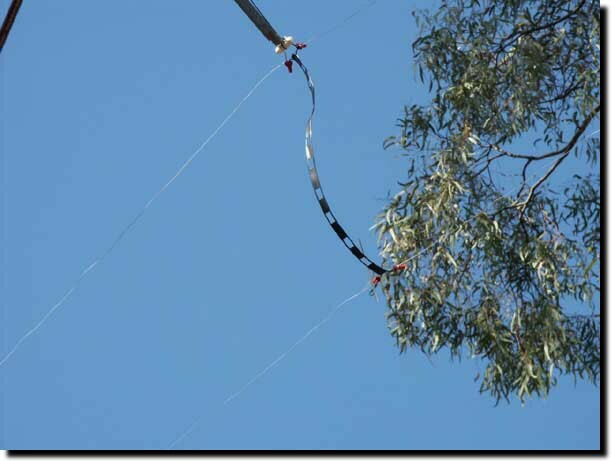 Although this might not look stable, the antenna recently withstood 60 mph winds that tore my 17 meter antenna apart. Although I have no rotor attached to either moxon, I use the armstrong method to turn them in the direction I want. I typically have the antennas face 40 degrees in the daytime to talk to the USA and parts of Europe and Africa, and I turn them to 300 degrees during greyline to talk to Asia and the South Pacific. To make the insulators between the elements, labeled as measurement "C" in the software above, I cut strips of Lucite purchased from Home Depot. These work great. I have seen people use other materials including plastic twine, string, wood and just about every other material that would work as an insulator. The important thing to remember is that you need the critical measurement between the elements. My solution is easy to precisely control the spacing. The wire is crimped on itself and not soldered. I attach the elements to the spreaders using plastic wire ties. A small piece of duct tape on the fiberglass rod helps stabilize the positioning on the spreader. Be sure you measure the precise point where the element turns 90 degrees and connect that point to the spreader as shown. Here we see the suspended 17 meter moxon pointing east from my qth. To turn the antenna, I have small lines attached to opposing spreader ends. Like an inverted puppet I can swing the antenna around to point it any direction. I then tie down the lines to keep the antenna stable. 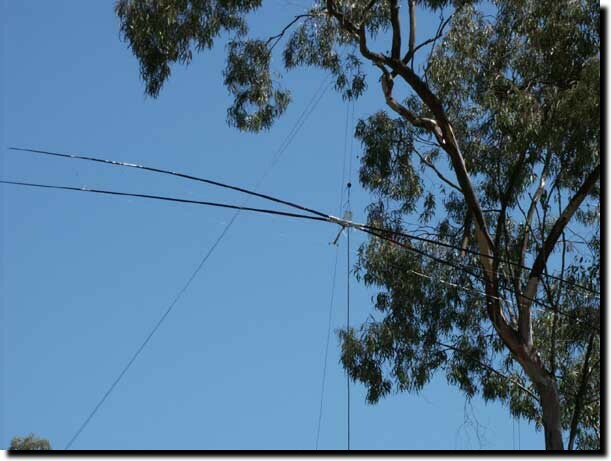 Be sure you wear a hard hat and eye protection if you hang antennas from trees. You should wear these items anyway while working on a tower or under a pole. Wearing a white lab smock adds a layer of professionalism that your neighbors, and wife, may deem over the top and call those other guys with white coats to take you away. I have noticed an interesting phenomenon. Hanging the beam from a single point creates what I call the "DX-Vane" effect. Simply stated, the antenna automatically faces into the dx. Like a weather vane facing into the wind, the freespace moxon will always point to the strongest dx signal if allowed to swing freely. This unusual and valuable feature makes the moxon the ideal antenna for the avid dx hunter. Traditional mast mounted beams cannot duplicate this function, so it is little wonder such claims are initially met with skepticism. Here we see the moxon pointing 17 degrees during this morning's rare west coast opening to India and Pakistan...Fantastic! Here we see both my 17 and 15 meter moxons. A beautiful sight to be sure. But the real beauty is the way these antenna perform. 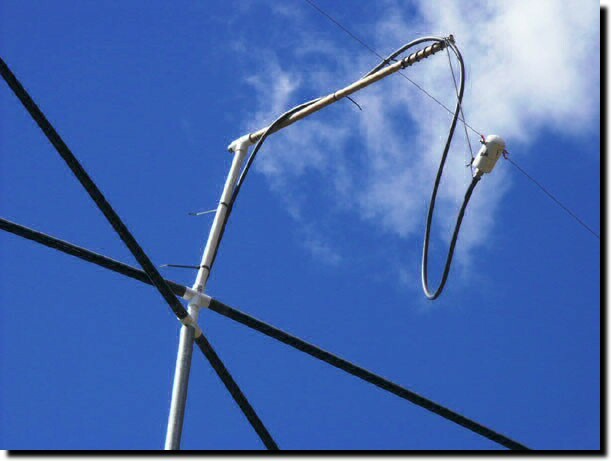 If you have never used a directional antenna, and have only used dipoles or loops, you will be very impressed. I have seen 4 to 5 S units better on receive and transmit over my quad loops described elsewhere on this website. According to Cebik's pages on wire beams, compared to the X, hex and vk special, the moxon has the greatest forward gain and the greatest front to back of all wire beams he reviewed. My good friend Ron, AB0YY and I have tested our moxons. As he rotated his antenna on transmit, I saw his signal change from 15db over 9 to S6 and back up. For two little pieces of wire, that's a lot of performance for a very small cost. I tried adding a second set of elements to create a dual band 17/20 meter moxon using a single feed. I connected several different feed lines to the 20 meter element. Here we see some 450 ohm line connect between the two elements. Although I made the antenna work this way, I was not very happy with the performance on either band. I had this one up for about a few weeks before I took it down and removed the 20 meter element. Multi element, multi band moxons have been created, but you must use individual feed lines for each band. A moxon is a monoband antenna. Although people have tried to make them multiband, they are not. Get a hexbeam if you want a multiband wirebeam antenna. They work great. 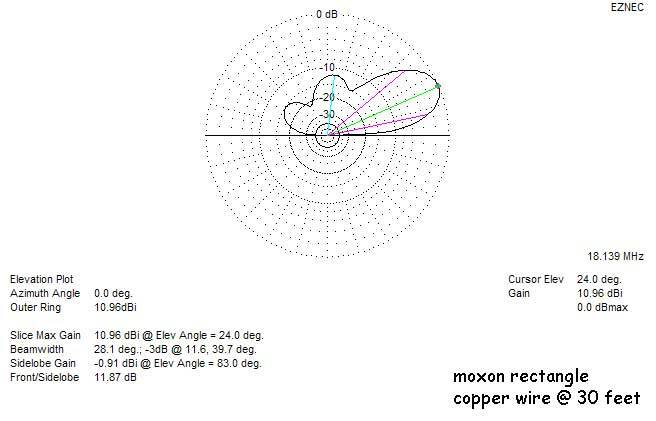 Below are two eznec plots for my 17 meter moxon at 30 feet using solid copper wire. So, that's the story of my moxon. 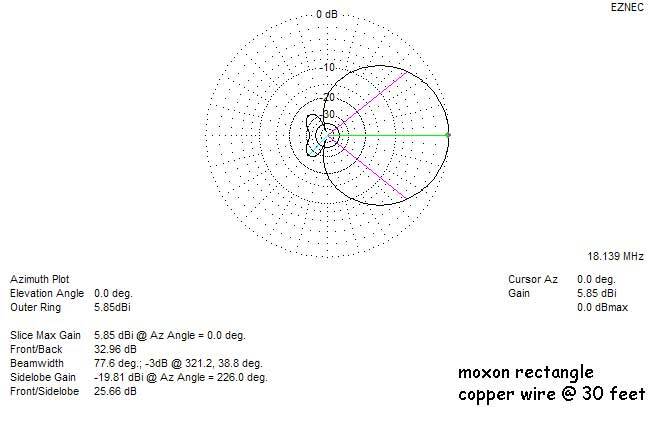 There is a great deal of additional information available at the "Moxon Antenna Project" website that will allow you to see many different moxons and read about how they were built. 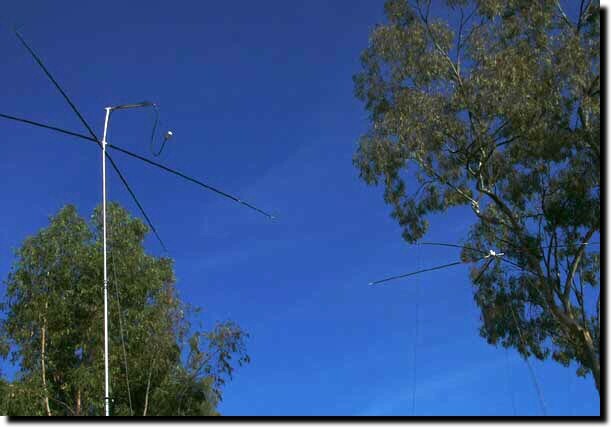 Please visit there if you have an interest in building one of these great antennas. If you have any questions, do not hesitate to email me. I will help you acquire the materials you need to build your own moxon.